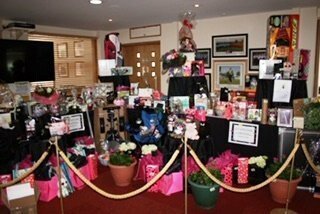 Four Abridge Ladies and one Gent took a day off from golfing to go hunting (and scrounging) for gifts for the tombola in aid of our wonderful Charity Golf Day spectacular in aid of Prostate Cancer. 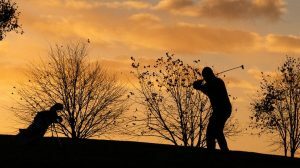 Although Our Charity golf day is not until June, we are already working hard to make sure that once again our day is perfect. As we have already raised over one million pounds in the past and £22,500 last year we have a lot to live up to! So with this in mind The Abridge ladies and Brian got up early and drove to the Spring Fair at the National Exhibition Centre in Birmingham. 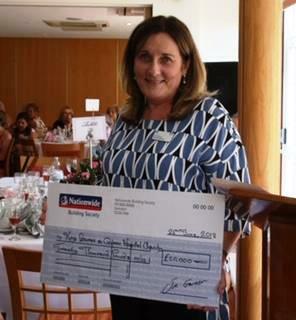 Armed with wheelie trolleys and pictures of our previous tombola and cheque presentation along with information about the specialised microscopes we are raising funds for The Abridge golfing ladies paired up and started to circulate. The generosity of the participants in the spring fair was overwhelming. Stopping at each booth in turn we introduced ourselves, said we came from Abridge Golf Club, showed our pictures, and asked if the stallholders could help us. And unbelievably they did! Kitchenware, candles, toasters, trays, pictures notebooks and so on were freely given with a smile and wishes of good luck in our venture. Brian very kindly lugged our freebies back to the car as each of us became loaded down. It was very exhausting but most exhilarating! My thanks to our wonderful ladies who came with to make the day so successful. Alison Levy our charity chairman Pam Levine and Maureen Hart. I was there too (Deborah Jacobs lady captain). Also a special thank you to Brian Allsuch, for helping us, and keeping his wife Lesley’s legacy going. Lesley started the charity day and we all miss her, but the day is still there to honour her. If you have any gifts that you would like to donate for our tombola we will be very pleased to accept them. We also need sponsorship. I am pleased to announce that Paula Wendleken is going to do a 3 mile open swim for us. Many thanks Paula and good luck! Please come and join our Abridge golfing ladies for our wonderful annual charity day on Tuesday June 25th 2019. You can be assured of a very warm Abridge Ladies welcome. We look forward to welcoming you to our beautiful golf course here at Abridge in Essex.